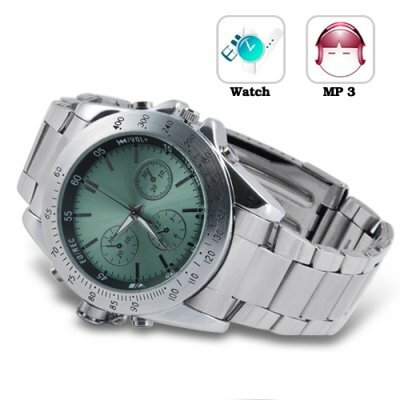 Successfully Added Metal Fusion - Stainless Steel MP3 Watch with Equalizer (4GB) to your Shopping Cart. well worth the money. now i dont have to carry around my ipod and it looks stylish too. the recording quality is really good. better than my smartphone. so far havent had any problems with it and ive been using it for about 2 months. its also pretty funny when others ask why there is a cable coming out of the watch and you tell them it plays music and they say thats amazing! esse relógio é muito bom, o som é exelente, só faltou possuir radio FM pra ser melhor ainda! This is well worth the money. Solid stainless steel and very good sound quality. I bought this for the voice recorder and I am impressed. It records people over 3 meters away. I first opened the file in itunes and it was bad quality but open the file in realplayer (realplayer sp is the latest). It looks and feels like a watch you would buy from a jeweler. Not sure on how long the battery life is though, I will post again after I have used it for a long period of time. It would be nice to know if the watch runs of a independent battery and instructions that go into more detail about the watch ie maintenance. Have no idea on how the equalizer works but I'm sure it does. If you are thinking about it just buy it. Well worth the money and if it is something you only use once you could sell it for more, Very impressed with the quality. Delivery. Ordered on Saturday and delivered on Friday (to Australia). Thanks again CV if there is an 8GB one that comes out I will be the first to buy it.